Typically-developing children appear to follow a chronological sequence of maturation. Their development advances through a series of more or less observable and measurable events. These are known as developmental milestones. The process of development itself may be though of as the “orderly and relatively enduring changes over time in physical and neurological structures, thought processes and behavior” (Mussen, Conger, Kagan and Huston, 1990:4). Chronological development is usually also taken to mean that capabilities developed at an earlier stage/age are necessary for developing more complex capabilities – built on this earlier foundation – at a later date, i.e. it implies the notion of progress from behaviors that are relatively simple to those that are more complex. A child’s development begins at conception, their genetic inheritance being determined by a combination of their parents’ genetic material. Over the next few years, as their physical and neurological structures mature, they learn to crawl, sit, walk, run, hop, maintain eye contact with an object, transfer their eye gaze from an object to a person, and so on. This biological maturation leads to the development of cognitive processes such as understanding that objects continue to exist in the world even though they may not be in sight, logical reasoning (e.g. if pencil A is longer than pencil B, and pencil C is shorter than pencil B, then pencil A must be longer than pencil C), and abstract reasoning (e.g. hypothesiszng about intangible concepts such as justice and morality). Cognitive development will lead to the child performing particular behavious in the world, e.g. it will influence how a child functions socially, how the child approaches real-world difficulties and challenges. Of course, all of this is likely to be influenced by the child’s environment. For example, a child who is consistently belittled in front of others is, perhaps, more likely to have difficulty building healthy social relationships, whatever their biological and/or cognitive development. From extensive studies of child development we have a good idea of what skills and abilities to expect of the average child at any particular age. For example, between 2;00-3;00 years of age a child will typically be able to identify body parts on themselves and on dolls, understand the difference between big and little, match about four colors, combine some nouns and verbs into short two-word phrases, understand about 300 words, and use 50-100 words expressively. Milestones such as these, therefore, can serve as progress markers. Language delay, then, is the failure to develop language capabilities at the expected time. What this means is that the child is, in fact, progressing through the expected developmental milestones but he or she is acquiring the relevant capabilities several months after their typically-developing peers. Language delay may or may not present a difficulty. For example, a child who is lagging about four months behind is unlikely to be experiencing any substantive disadvantages owing to the delay. He or she may not be quite as intelligible as other children the same age, and may not use as many single words when communicating, but they are still likely to be able to function adequately. Adults will characteristically make allowances for such immaturities and, interestingly, other children are often more likely to be able to understand what is being communicated than the adults. Of course, this raises the question: how much delay is too much delay? Well, there is no easy answer to this. If, for example, the child is following the typical developmental sequence but is lagging 12 months behind this may not be as important for a 12-year-old child as it is for a three-year-old child. A delay of 12 months for a three-year-old is one-third of their lifetime and, as we know that the first five years of life is when the greatest amount of physical, neurological and cognitive development takes place, including the development of near-adult language skills, the potential adverse impact of a 12-month delay is significant. I tend, therefore, to gauge the significance of any delay by examining how it is affecting the child’s ability to function in their environment. For example, a child of 5;00 years attending a Primary School is expected to demonstrate what is known as integrated attention, i.e. they should be able to work at a task (such as drawing a picture), attend to verbal commands (given by the teacher) and amend their actions accordingly. A delay in attention control of around 12 months may mean that the child remains highly distractible, being easily distracted by any extraneous noise in the environment (e.g. someone laughing outside the classroom; the sound of an ambulance passing the window outside). So, in this instance, the delay is of such a magnitude that it is adversely affecting the child’s ability to benefit from his or her educational experience. 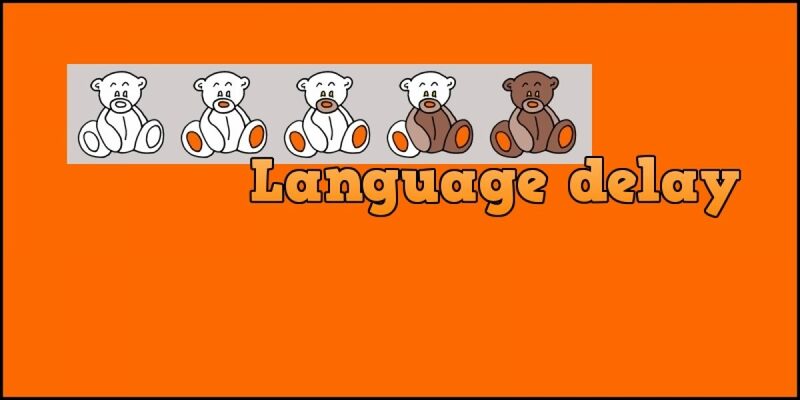 Language delay is often categorized as either receptive language delay or expressive language delay (see ‘Language’ for an explanation of receptive and expressive language). Of course, as with many communication problems it is possible to have so-called multi-component disruptions. So, a child does not necessarily exhibit either a receptive delay or an expressive delay: they may, in fact, show signs of both at the same time. Because development is progressive, moving from simple to complex behaviors, it is usual for receptive language skills to be in advance of expressive language skills. This is reasonably logical, i.e. one has to understand language before one can use it effectively expressively. It would be unusual, therefore, for a receptive language delay to be greater than any co-occurring expressive language delay. If this situation did arise (e.g. the child’s expressive language skills were delayed by around six months but their receptive language skills were delayed by around 12-18 months) then this may constitute a language disorder. That is to say, the child’s development is no longer following the typical developmental sequence of the average child. In this instance that child is seemingly demonstrating expressive language skills that do not appear to be warranted by his or her underpinning receptive language skills. Such a situation would necessitate further investigation. Speech therapists are trained to assess children’s attainment of relevant language development milestones. Often they will use published assessments (which may involve, for example, showing the child pictures or objects and having them identify and describe them or playing with the child in a highly structured manner) which provide information which can then be compared against an average (or norm). For example, we know that a child of around two years of age should be able to form short two-word utterances with a Mean Length of Utterance (MLU) of between 1.0-2.0 morphemes. It is a relatively simple matter to record several of the child’s spontaneous utterances, calculate an MLU and then compare the score against the published norms in Table 1 (source Miller (1981) (download information on how to calculate an MLU). MLU as a measure on its own is not, however, robust enough for us to unequivocally determine if the child has a delay. Information such as this must be combined with other measures in order to give a broader profile of the child’s language development. Some further measures – which are discussed on this website – are provided in Table 2 for consideration. They are, as indicated, not exhaustive but they should serve to give you an idea of how a child’s language performance can be measured against published norms. ICW = Information Carrying Word, i.e. the minimum number of words the child needs to understand in order to comprehend an utterance. For example, if presented with two sets of objects (1) key, ball, pencil, and (2) cup, box, purse, and instructed to “Put the key in the cup” the child needs to understand the two information carrying words key and cup. If the child can carry out this command successfully, he or she would be said to have demonstrated comprehension at a Two Information Carrying Word level (2ICW). There is considerable variation in the ages at which children arrive at these milestones. It must always be remembered that the norms are just an average. This means, therefore, that some children will develop certain capabilities several months before their peers, and other several months afterwards. As discussed above, this does not have to imply that the child will experience any functional difficulties communicating. For example, there is controversy about just when the Complex Utterance Stage is completed. Some researchers claim that at 5;00 years of age a child has developed all of the major adult linguistic features and that the only real progression beyond this stage is the further acquisition of vocabulary items. Other researchers, however, argue that children up to the age of 12;00 years are still developing adult syntax (McTear, 1985; Crystal, 1989). In addition, Table 3 shows the age ranges over which children can be expected to gain mastery of the morphological features set out in Table 1. Used correctly 90% of the time in obligatory contexts, i.e. in contexts in which Standard English requires the use of the morpheme (e.g. in the utterance “he is talking” it is obligatory to add an -ing suffix because it is required in the context of a progressive action). In the same way that receptive language delay can co-exist with expressive language delay, each of the following causes of delay may also co-exist, e.g. it is possible for a child to have a hearing impairment and to experience social deprivation at the same instance. As with all child communication difficulties one should always check the hearing: impaired hearing may interfere with language development (and speech development). There may be intermittent loss owing to glue ear (otitis media) or there may be a more persistent conductive hearing loss or sensori-neural hearing impairment. This is fairly common, with around 6% of children exhibiting some sort of language delay in combination with a general developmental delay (in, for example, physical growth, gross motor control, fine motor control). The majority of these resolve over time. We have already noted that the environment can influence biological, cognitive and behavioral development. Children require appropriate stimulation in order to maximise their development. Some children exhibit socially inappropriate behavior that may put themselves or others in danger and/or may limit their access to everyday community facilities, such as schools, libraries, riding the bus, and so on (Emerson, 1995). This can lead to the child being withdrawn, socially isolated and prone to mood changes. Such factors are known to correlate with language delay. The causes of challenging behavior may be medical, psychiatric and/or environmental. Brown, R. (1973) A First Language London: Allen & Unwin. Crystal, D. (1989) Listen to Your Child: Parents’ Guide to Children’s Language Harmondsworth: Penguin. Emerson E (1995) Challenging Behaviour: Analysis and Intervention in People with Learning Disabilities Cambridge University Press. Cambridge. McTear, M. (1985) Children’s Conversation Oxford: Blackwell Publishing. Miller, J.F. (1981) ‘Eliciting Procedures for Language’ Miller, J.F. (ed) in Assessing Language Production in Children Edward Arnold.